Tucson Bankruptcy Lawyers | Bankruptcy Attorneys in Tucson, AZ. Are you living in Tucson, Arizona or Pima County, AZ and struggling to make ends meet? Do creditors harass you over the phone and through the mail? Does your financial future seem hopeless? If so, there is a solution to your problems! The experienced Tucson bankruptcy lawyers of My AZ Lawyers offer free consultations and debt evaluations. Find out what types of debt relief are available to you and your family. Let our low priced Tucson bankruptcy attorneys and staff explain the difference between Chapter 7 bankruptcy and Chapter 13 bankruptcy. Our Tucson bankruptcy law firm offers some of the lowest fees on Tucson Chapter 7 bankruptcy and Tucson Chapter 13 bankruptcy filings. Our expert lawyers will explore which form of debt relief may be the most beneficial for your particular situation. These affordable bankruptcy lawyers in Tucson can help you achieve the financial freedom you seek. With reasonable monthly payments, you can become debt free as soon as TODAY! Call our Tucson bankruptcy attorneys now. Bankruptcy in Tucson – Since the bankruptcy laws changed in 2005, there are many misunderstandings and misconceptions out there regarding declaring bankruptcy and the bankruptcy filing procedure. One of the misconceptions is that it’s harder to file for bankruptcy now than it was before the law changes. Another myth of sorts is that not everyone can file or qualifies to file bankruptcy anymore. Bankruptcy in Tucson did get a little more difficult after the law changes. However, the updates make things more difficult on the Tucson bankruptcy lawyer’s side, but not necessarily for the person seeking bankruptcy protection. Tucson Bankruptcy Lawyers at a Discount. Time is of the essence when deciding if you should file for bankruptcy. Many of your financial situations are already dire and pressing, there is no time to waste when you have made the decision to do something effective about it. Tucson bankruptcy lawyers from our Tucson bankruptcy law firm can assist you in determining how to resolve your financial situation and protect your rights through affordable debt relief. Isn’t it time for a fresh start? 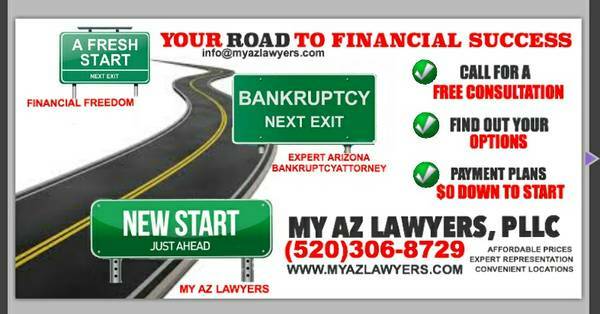 The Tucson bankruptcy lawyers from My AZ Lawyers can provide you a new start at a fraction of the cost. Do I Need to Hire an Attorney to File Bankruptcy?